Bookcase storage can be an essential element in any room of your home - including the great room, home office and kids play room. 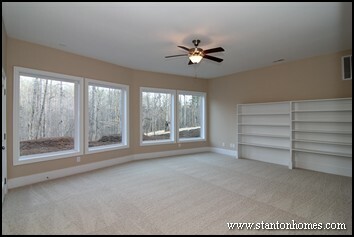 Get bookcase storage design ideas for you new home, in these 2014 custom home photos and layouts. 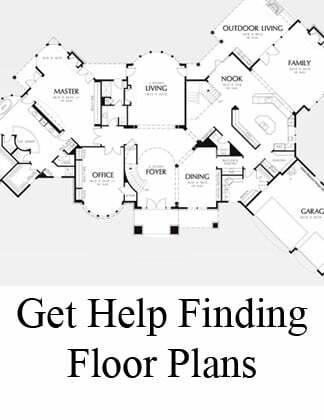 In traditional floor plans, the foyer opens into a formal dining on one side and a formal living room on the other. In this more modern home plan example, a home office replaces the formal living room. 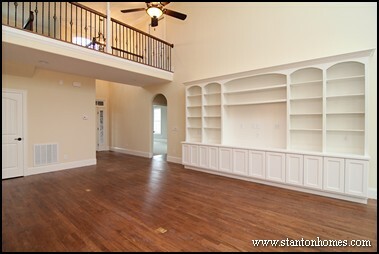 Full-height built-in bookcases and cabinets offer tons of work storage space. These bookcases where designed to make an upscale, elegant impression on business visitors. 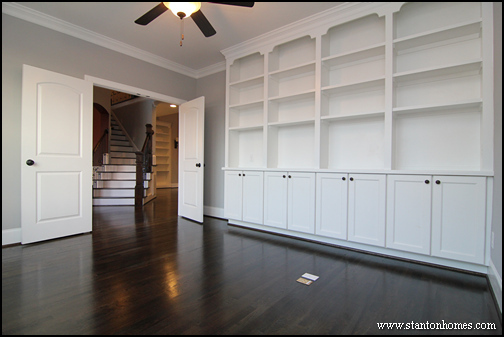 More 2014 homes are integrating built-ins throughout the home. 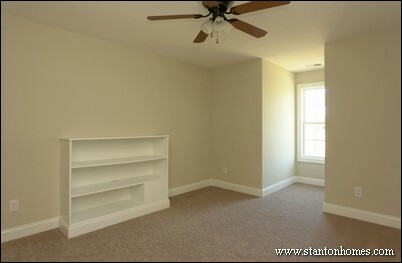 In this example, a bookcase and entertainment center combination - with a space for a flat screen TV - was added to the great room. Lower cabinets offer hidden storage, very handy for all kinds of items. 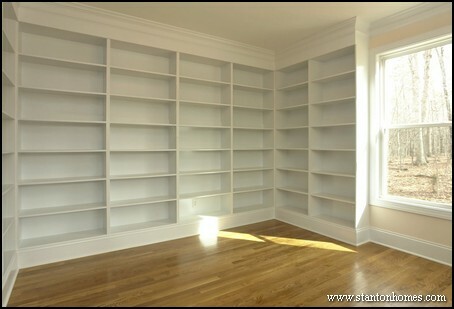 In places where you have less wall space - or unique angles - smaller bookcases can be custom-designed to fit the space. 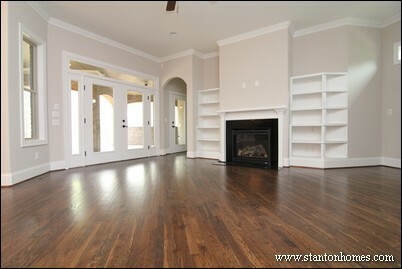 In this custom home, the homeowners added small bookcases to each side of the keeping room fireplace. 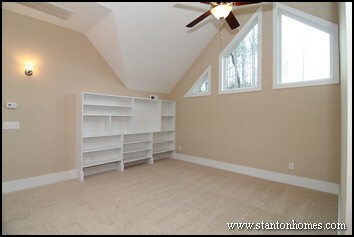 If you are looking for a full library - rather than a home office with built-ins - take a look at this design. 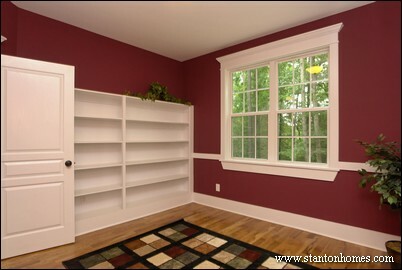 There are bookcases on three walls, with large windows to bring natural light into this reading space. 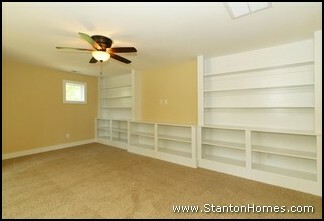 The bonus room is the perfect place for a wall of bookshelves, with room for a large screen TV. Shelving in an open loft area will keep the space clutter-free. 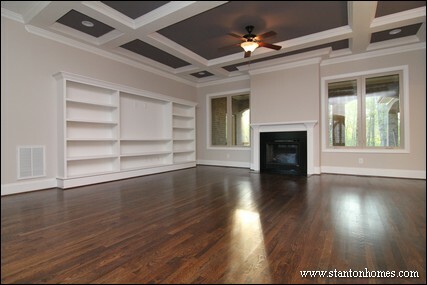 In this custom home, a built-in bookcase doubles as an entertainment center in the second story loft, which overlooks the great room. 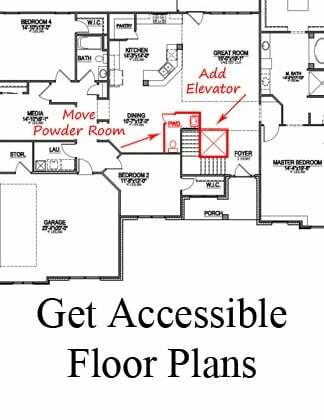 Basements make great spaces as "man caves" or large hang out areas. In this custom home, rows of bookcases were incorporated in this wide open basement - which still has space for a pool table in the center. If you decide to designate a play room for your kids, a built in bookcase can be extremely helpful - for games, books, and toys. These shelves are designed to fit rows of baskets and buckets. 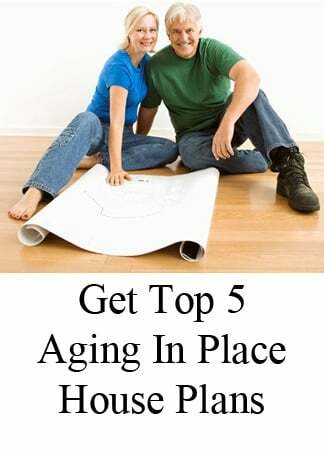 In the bedroom, you may want to keep the built in storage simple, and more in line with traditional furnishings. Adding a small bookcase or open shelving will help keep your most popular books, games, toys, and blankets organized and accessible. 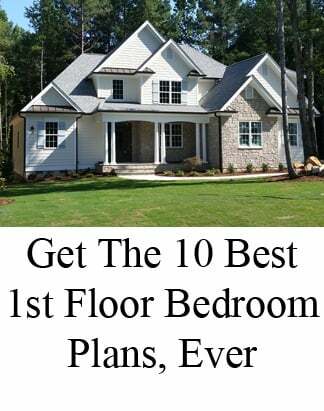 Whether you're looking to clear clutter, get organized, or make your space more usable, these built in bookcase storage design ideas give you a good idea of how 2014 new homes are building in storage.